Can we take a break from yapping about our fabulous Alabama Chanin giveaway (still ongoing–everybody enter by Friday), and our fun Walk in the Park on January 17, and that Other Thing We’re Excited About that is coming soon that we can’t wait to tell people about? 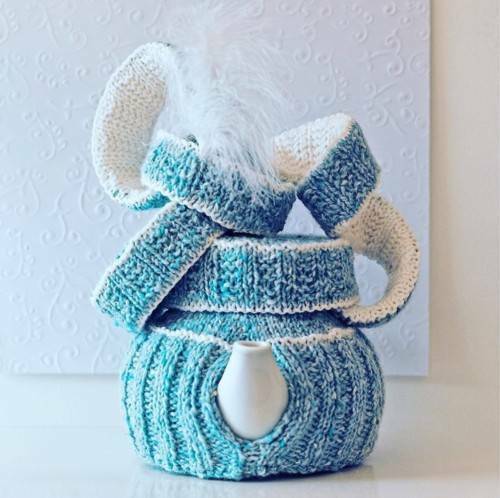 Because I want to talk about tea cozies. Or cosies, as they are spelled in Australia. Back in 2012, Loani Prior kindly sent me a copy of her third book on knitted tea cozies, How Tea Cosies Changed the World. Yes: her THIRD BOOK ON TEA COZIES. How Tea Cosies Changed the World is the followup to Really Wild Tea Cosies, which is the followup to (merely) Wild Tea Cosies. 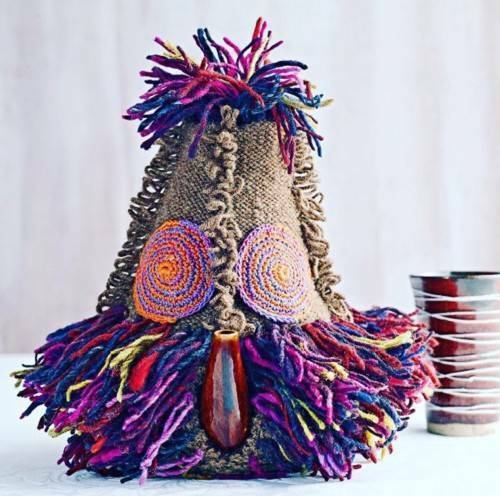 And in 2015, unbelievably, there is a fourth: Pretty Funny Tea Cosies. It must be true (to paraphrase John Prine) that old trees just grow stronger, and old tea cozies grow wilder every day. Tammy Shanter, from How Tea Cosies Changed the World (HTCCTW). 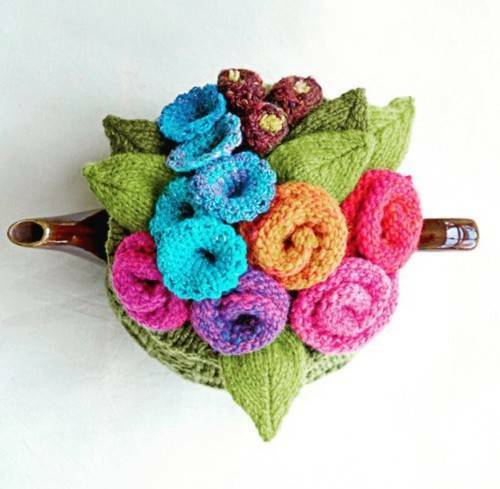 Garden Party, from Really Wild Tea Cosies (RWTC). Pedro de la Pantaloon, from RWTC. The Brits and Australians have a tradition of tea cozy affection that somehow missed the colonies that became the United States. I mourn this loss to our cultural richness. Apparently the crazier tea cozies are, the better, and the longer they are kept, and handed down from one generation to the next. I have no ancestral tea cozies. This makes me sad. That’s all I’ve got. How is that Other Thing We’re Excited About coming along? 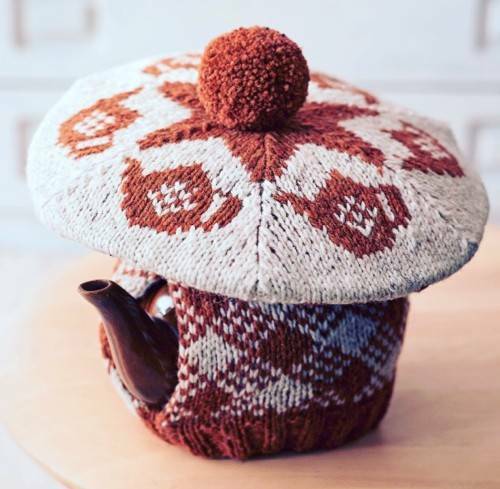 The thing about tea cosies is that they actually keep your tea warm, so you can make a pot of tea, have a cup, read a blog or two, la de da, get another cup — and it is still nice and hot! No point, really, in having a tea cosy if you just dunk a bag in a mug, though…. Oooo those books are so cool! I have actually knit a tea cosy/cozy, the Barrel Cactus Tea Cozy by Gina Russell on Ravelry, It was so much fun (and so much work — all those spines! — I bought a larger teapot rather than re-knit it). Now I want more cosies. And thanks for clarifying the spelling ( z or s?). I didn’t realize it was geographical. Cosies become hats with very little effort. I feel rather embarrassed that the cozy I am using this morning, and every morning, is a failed modular hat circa 2000 made with Kureyon. I gave up on the hat, felted it, and it just fits my teapot. I might be wrong, but I think that Elizabeth Zimmerman’s infamous Baby Surprise Jacket was created from a “failed” attempt at making a baby hat. Ha ha, I have the reverse, a failed tea cozy that is now a hat. No, I hadn’t cut the holes yet! 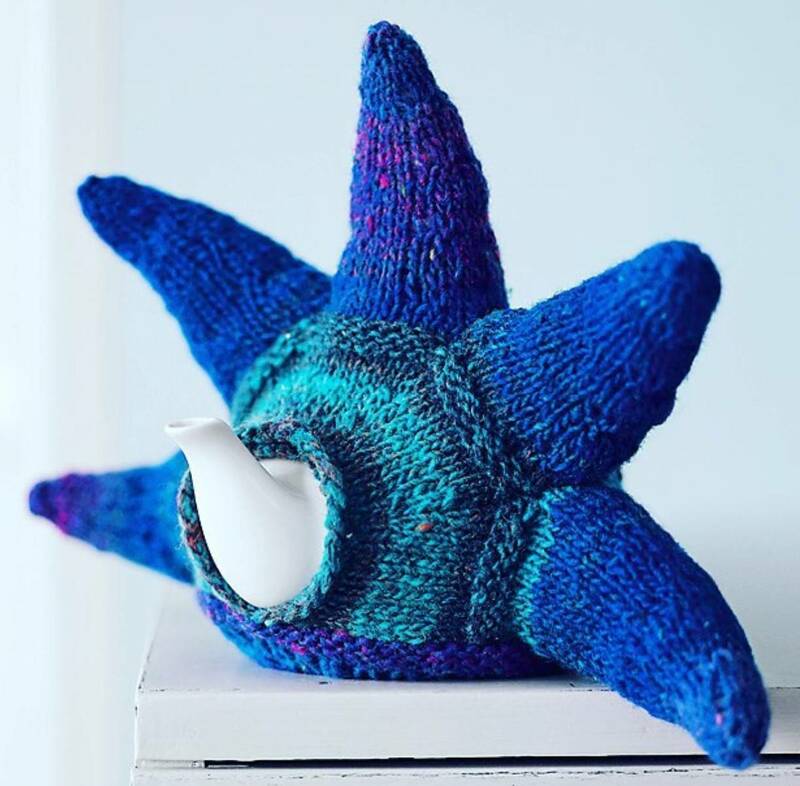 Wow, I must admit, I never really thought about tea cosies before. They look like so much fun to make. I only have an electric tea kettle, so I am not sure if any of those work for it? I have many teapots, but only two tea cozies. A great failing on my part. This just made my day! Pedro de la Pantalon must come to my kitchen! Off to buy the book – thanks so much for bringing him into my life, your posts always send me all over the Internet. I’m a better formed knitter bc of you two. One of my dearest friends who has a great deal of style had me over shortly after her new marriage and made us a pot of tea in her beautiful new teapot – then tossed an old dishtowel over it to keep it warm. I said to myself, “you’re a knitter and this will not do” (like ya do) and promptly churned out a “Coffee, Tea or Me” cozy in her signature purple. That started the bug; I got Wild Tea Cozies and never looked back! Tammy Shanter will be mine. LOVE the DIY Magdalena Mid-Length skirt! I have the wild tea cozy book. Never needed anything out of it but it has provided many hours of pleasure and hilarity. I did once and it a traditional cozy for my daughter. I drink tea every day so not sure why I don’t have my own tea cozy. That may be remedied soon! This are A-mazing, would-never-have-thought-to-knit-this beautiful knitting objet d’art. Truly gorgeous. I would like to learn how to make the flowers. I loved Belinda’s knitted wreath and have thought about it (and her) often. Thanks for sharing those. What fun! and amazing! You know what they say: “Never trust a man who, when left alone in a room with a tea cosy, does not try it on”…although if he is alone, how would you know? I knit a not wild, but attractive brown cosy to cover my old Brown Betty. It does have a pompom tho’, and will do as a hat in a pinch. I think I need a wild one for special occasions. The simple European glass tea pot that I use for infusing garden herbs, roots & twigs and such does not have a cosy. hmmm, a winter project. Look at the free patterns. Love the hat, probably inspired by the teacozies. My alternate self has moved to Australia where I might see one of these hats on the street. Here’s your “blondie” question for the day…can you please tell me how to get back to your post from a couple of days ago about the Natalie Chanin giveaway? I would love to have a chance to win! I’ve watched these projects from afar, and would love to make the poncho so I could wear it with absolutely everything! Thanks for sharing! From one blondie to another . . . just click at the very top of our website, above the logo. There’s a link to that post. Wishing you good poncho luck. Blondies may have more fun (or not! ), but this one certainly didn’t read before asking the question! I never looked at the very top of your website…color me red! Thanks so much…crossing my fingers f or good luck! What is that wet stuff in my eye. Feeling very ‘motional. What a beautiful post on my behalf. Thank you thank you thank you. Wet stuff and wide smile all at once. Now see! That’s why history is important. I love tea cozies! I come from a family of tea drinkers, but they never got into all the fun tea stuff. I love the fun tea stuff! It all makes the tea experience better. Teapots, infusers, tea balls, those little teapot shape dishes to hold your whatevers. I do use teabags at work, and I won’t turn down a flavored tea I like just because it happens to come in a bag, but I prefer loose tea. I think it tastes better and I like using my teapot. Yes, the crazy hat gene has definitely mutated into the crazy tea cozy/cosy gene. True story. My family moved to England for a few years in the 1960s. My mother, home with two small children, did a lot of knitting and sewing. She made tea cosies as gifts. She sent one to an American friend and got a nice thank you note for the hat, although her friend did wonder about the ear holes. I’m so pleased you are both back to regular posting – makes my day, daily! I have a suggestion to help your readers keep MDK as our North Star. You provide so many wonderful links to other sites; I often find myself going down the rabbit hole of patterns, recipes, new blogs, etc., and I lose my way back to MDK. Might it be possible for you to make your links to exterior websites open in a new browser, thereby leaving the MDK page live and easy to return to? Perhaps it’s complicated, perhaps I’m lazy and easily confused. Regardless, I’ll always find my way back, so I’m glad you are back, too! P.S. Now thirsty for tea. My tea cozy is knitted from Purl Soho’s Last Minute Knitted Gifts, except in sturdy Cascade instead of cashmere. I have just caught up with a week of your posts because of a 3 1/2 day power outage and a business trip. It is my little luxury to myself to read them all this morning. Do they actually slow down the cooling process?